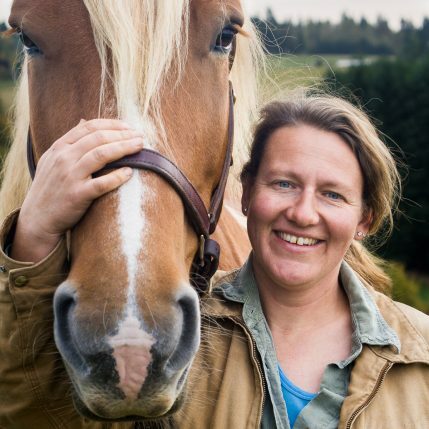 Welcome to the first Winter CSA pickup of the season! When most people think of fall color they think of leaves turning vibrant red and yellow on deciduous trees around town. That is one of my favorite things about this time of year, but what we have for you this week is just as beautiful, and certainly tastier… lovely golden sweet peppers, rainbow lacinato kale, and the VERY pink Watermelon Radish aka Red Meat, Rose Heart, Stargazer. This radish is an heirloom Chinese Daikon. The round roots are cousin to the turnip and about the same size. Their unassuming greenish white exterior hides a beautiful and shocking pink interior. The flavor is a little bit spicy, peppery, crisp and faintly sweet. They can be eaten raw, diced and roasted with other root veggies or made into beautiful radish pickles. Lots more great winter veggies to come this season so let your friends know that they can still sign up for our Winter Spring CSA Share which is starting THIS WEEK! Amazing recipes for Watermelon Radish and everything else in your share are available to members at Cook With What You Have. If you joined our Winter CSA you will find your password in the member email. Enjoy 24/7 access to recipe inspiration! Fennel Bulbs: When the bulbs are sliced raw into salads the fresh anise flavor stands out. The longer the bulbs are cooked, the more subtle the flavor becomes. Try them sautéd with onions and greens or make this Soffrito. Lacinato Rainbow Kale: This beautiful, diverse & tasty kale is from a cross of Lacinato x Redbor hybrid kale. Bred & selected by Frank Morton, seed breeding rock star at Wild Garden Seeds, we’re excited to be growing this diverse population again. It includes the leaf qualities that Lacinato is loved for, overlain with hues of red, purple, and blue-green. In addition to great flavor, we also appreciate that it is more vigorous and cold hardy than most strains of Lacinato. OSSI (Open Source Seed Initiative) Pledged Variety. Leeks: These lovely King Richard leeks have beautiful long white shanks. When chopped and sautéed they add a sweet rich onion-like flavor to any number of dishes. One of my favorite ways to feature them is this Leek Galette. Lettuce Heads: These butterhead varieties make a scrumptious salad! Sweet Peppers: A mix of Stocky Red Roasters, Gatherer’s Gold with a few Jimmy Nardello’s mixed in. This will be the last of the sweet peppers for the season. I’m always amazed when they make it until November, but we’ve had a beautiful fall this year! Winter Squash: These Gill’s Golden Pipin squash were developed locally in the mid 1900’s and remain a favorite today. They have a small acorn type shape, beautiful golden color and rich sweet flavor. Hakurei Turnips: Japanese salad turnips are mild enough for, well – salad! The tops make really good cooking greens too. Coming soon… The Thanksgiving Share!! You’ll find recipes for the peppers and everything else in your share, at Cook With What You Have. If you’re a CSA member, you will find your password in your most recent email. Enjoy 24/7 access to recipe inspiration! Cauliflower: All the different varieties can be eaten raw or cooked just like regular white cauliflower. I usually roast florets or steaks in cast iron or under the broiler. Simple Italian flavors like olive oil, garlic & red pepper flakes work well or try it with asian spices like soy sauce, ginger and siriachi. No matter what you do, make sure and let the cauli cook with enough heat to get it carmelized on the edges! This recipe is from one of my favorite Sellwood restaurants – Gino’s Cauliflower Pasta. Or try this Cauliflower Cake recipe that one of our shareholders recommended from Plenty More by Yotam Ottolenghi. Or try these variations on the popular East Indian Aloo Gobi. Fennel Bulbs: These big fennel bulbs are tasty shaved into salads or sautéed. If you head over to the Cook With What You Have website, you’ll find recipes for braised fennel with sweet peppers and this delicious soffrito. Greens: Italian Rapini Greens (aka Sessantina Grossa) are traditionaly cooked, but since the flavor is quite mild I often put them in salad. Leeks: These cool fall evenings are perfect for Potato Leek Soup! Lettuce Heads: The heads are small, beautiful and tasty. Hot Peppers: Choose (in order of hotness) from Jalapeño, Czech Black and Bulgarian Carrot. The latter is a beautiful orange and similar to the heat of a serrano pepper. If you’re a hot pepper fan, then you probably already know about the Scoville Scale that rates the relative heat of all hot peppers. Sweet Peppers: Your choice of several types of sweet pepper this week. We have red and orange sheepnose pimento peppers and Italian roasting peppers. All types have thick walls and sweet flavor. Try them raw, sauteed or stuffed. Potatoes: This golden yellow Nicola variety has a low glycemic index and is high in vitamins & minerals. Of German origin, this potato has a slightly waxy texture which makes it perfect for boiling, steaming or Potato Leek Soup. Tomatoes: These green tomatoes will make a nice Salsa Verde, a quick chutney and of course they are terrific fried. Check out some international ideas from The Kitchn. Turnips: Tasty little white Hakurei Salad Turnips are sweet and mild enough to be eaten raw or can be roasted with other root veggies. 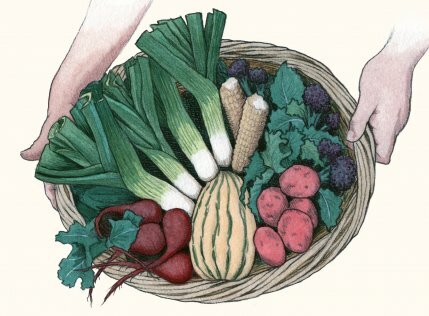 Coming Soon… The Winter CSA!! You’ll find recipes for the cauliflower and everything else in your share, at Cook With What You Have. If you’re a CSA member, you will find your password in your most recent email. Enjoy 24/7 access to recipe inspiration! Cauliflower: All the different varieties can be eaten raw or cooked just like regular white cauliflower. I usually roast florets or steaks in cast iron or under the broiler. Simple Italian flavors like olive oil, garlic & red pepper flakes work well or try it with asian spices like soy sauce, ginger and siriachi. No matter what you do, make sure and let the cauli cook long enough to get carmelized on the edges! This recipe is from one of my favorite Sellwood restaurants – Gino’s Cauliflower Pasta. Or try this Cauliflower Cake recipe that one of our shareholders recommended from Plenty More by Yotam Ottolenghi. Or try these variations on the popular East Indian Aloo Gobi. Escarole: Yay – the winter chicory season has started! This Italian variety has slightly bitter leaves that form a dense head. It can be used in salad or sautéed. Many cultures, including the Italians, cook beans & greens together. It is one of my favorite combos and you could use your Roma Tomatoes (and Rapini) in this recipe: Zuppa di Scarola e Fagioli. Italian Rapini Greens: aka Sessantina Grossa these are another traditional Italian green that is traditionally cooked but since the flavor is quite mild, I often put them in salad. Kohlrabi: I usually eat these raw – just peel them and cut into bite sized chunks or make wedges for dipping into humus or your favorite sauce. They can also be roasted or sautéed or mashed with potatoes or grated into fritters/latkes/okonamiyaki. Jimmy Nardello Peppers: This is definitely one of my favorite peppers – the fruit is beautiful red, thin skinned, early ripening and so sweet!! I first heard about these when I was visiting a farm in Pennsylvania at least 15 years ago. It took almost a decade for me to find the seed and start growing them. It is a traditional Italian frying pepper and this particular variety is named for the grandson of the man who brought it from Basilicata, Italy to Connecticut in the 1880’s. In addition to great flavor, I love that it is in the Slow Food Ark of Taste and has such a great story. More info about the people and the pepper can be found here. Kale: This cool fall weather is great for greens! Anaheim & Poblano Peppers: These are slightly spicier and way more interesting than your average green pepper : ) Try this creative variation on the classic Chile Relleno They are traditional in chile rellenos, but there are lots of other ways to use them. Once they are roasted I often make sauce – coarsely chopped or in the food processor. Try this one with pumpkin seeds or make green harissa. Love these little Pimento Peppers!! We tried some new varieties this year and both the red Liebesapfel and the orange Doe Hill are sweet and full of flavor. I also appreciate that these ripen well in our maritime climate without the use of plastic row covers. This type of agricultural plastic mulch is ultimately unsustainable, so we’re always working to use LESS plastic on the farm. It is great to have our local seed companies breeding and selecting varieties that help us do this too. You’ll find recipes for the sweet peppers and everything else in your share, at Cook With What You Have. If you’re a CSA member, you will find your password in your most recent email. Enjoy 24/7 access to recipe inspiration! Carrots: Yay for summer carrots!! Garlic: The name of this variety is Music and it is originally from Italy. The large cloves with beautiful pink skins are pungent but not overpowering. Collard Greens: This cool fall weather is great for greens! Sweet Peppers: Your choice of several types of sweet pepper this week. We have red and orange sheepnose pimento peppers and Italian roasting peppers. All types have thick walls and sweet flavor. Try them raw, sauteed or stuffed. Yum! Fingerling Potatoes: This Austrian Crescent variety is MY FAVE of all the fingerlings we’ve ever grown. The potatoes are waxy and flavorful and roast up really well. Coming Soon… Purple Cauliflower, Winter Squash, Leeks and The Winter CSA!! This week we have beautiful Thai basil and cilantro in the share. Might be a good time to make some Salad Rolls or Green Curry or Rice Noodle Salad. In addition, you will also find the makings for several variations on the salsa theme. Everyone has a favorite recipe for tomatoes, peppers & tomatillos – or try this Corn Salsa – yum! You’ll find recipes for the herbs and salsa and everything else in your share, at Cook With What You Have. If you’re a CSA member, you will find your password in your most recent email. Enjoy 24/7 access to recipe inspiration! Eggplant: Many diverse culinary traditions have embraced the eggplant. It features prominently in Italian, middle eastern, Thai and Indian cuisine – just to name a few. I did not grow up eating much eggplant and only became a convert in my first years of farming. My go to “recipe” for the Japanese types is to cut them lengthwise, drizzle with oil and grill on the BBQ or roast in the oven. I also really like this simple salad – Eggplant in the Moorish Style. You’ll find over 20 recipes for eggplant from many different continents at Cook With What You Have. Peppers: Your choice of Anaheim and Poblano peppers in the share this week. Both are moderately hot and can be used raw or cooked. Traditionally they are often stuffed & roasted & make great chile rellenos! Herbs: Fresh herbs this week are Thai Basil & Cilantro. See above for some recipe ideas. Summer Squash: This recipe for Courgette Gratin from Lulu’s Provencal Table is one of my favorites. I’m also fond of adding diced & sautéed summer squash to bean chile, scrambled eggs and quesadillas. Tomatillos: This cousin to the tomato is a sprawling plant with distinctive yellow and black flowers that become husk covered fruit. Cultivated since pre-Colombian times, it is used in a variety of Mexican and central american dishes. Often they are roasted for salsa verde, but can be used raw as well. Tomatoes: Heirloom & slicing tomatoes are coming on strong! The HEAT this summer has caused them to have more green shoulder than usual. If you find some hard green tops on the tomato, just cut around it and eat the rest of the delicious fruit. Luckily, the plants have been very productive you’ll get plenty of tomatoes in your share! We’re always experimenting with new varieties, and in some ways it can be good to have these extreme weather events as it shows us which ones make the cut. Coming Soon… More Tasty Sun Ripened Tomatoes!! This is definitely one of my favorite peppers – the fruit is beautiful red, thin skinned, early ripening and so sweet!! I first heard about these when I was visiting a farm in Pennsylvania at least 15 years ago. It took almost a decade for me to find the seed and start growing them. 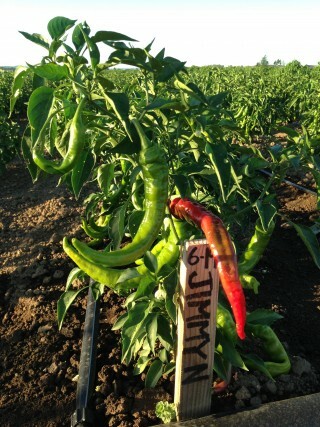 It is a traditional Italian frying pepper and this particular variety is named for the grandson of the man who brought to from Basilicata, Italy to Connecticut in the 1880’s. In addition to great flavor, I love that it is in the Slow Food Ark of Taste and has such a great story. More info about the people and the pepper can be found here.